The home of Roman gladiators, The Colosseum. 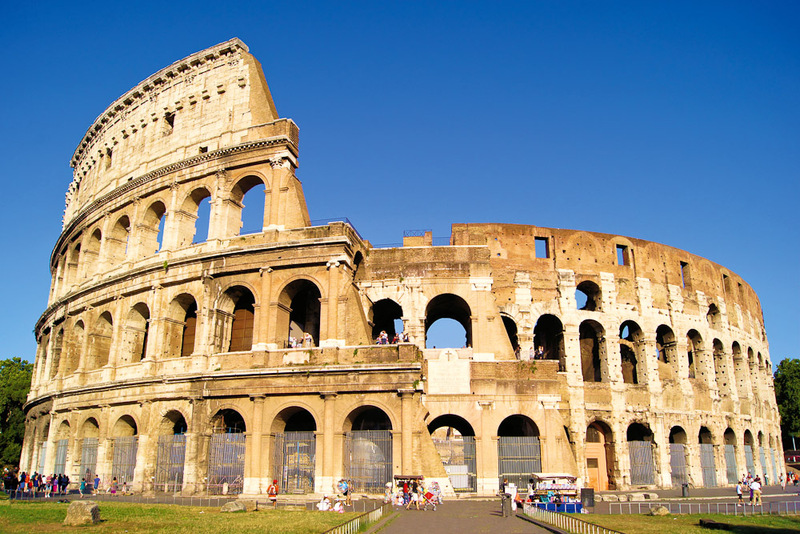 Susan Murphy sends her husband and son into battle to review the Eternal City’s Roman Gladiator School. Ulfragar, Son of Wolf, greets us at the entrance to the Gladiator School of Rome dressed in a maroon tunic, cinched at the waist with a wide leather belt, and a pair of lace-up boots. He looks as though he lifts weights to keep up his gladiatorial shape: wide shoulders, muscular legs and arms the shape of large hams. I’m impressed already, not by his physique but by his stamina; it is six degrees celsius and far too cold to be wearing a dress. The Gladiator School of Rome is located close to the Appian Way, the great cobblestoned highway built to carry Roman armies in and out of Rome, with the ruts made by ancient carriage wheels still visible. In battle at the Roman Gladiator School, Italy. The school is set up to replicate barracks complete with a small arena and museum. We accidently veer into what looks like a training ground, with sand bags swinging from ropes and a shed lined with racks of helmets and shields, and wonder what we’ve let ourselves in for. A week of sightseeing has led us to hunt out some action for our teenager; a two-hour class on how to be a gladiator. We are disappointed to find we are the only people here apart from Ulfragar; we were expecting combatants to pit ourselves against. In a passive anti-climax, the session kicks off with a tour of the museum, which has the feel of a backyard shed junk collection but actually holds some interesting pieces. Ulfragar, whose real name is Emanuele, walks us through the exhibits and we learn a few things that we haven’t already read in the guide books. Gruesome weapons and tales of characters such as ‘the doctor’, who finished off half-dead gladiators with a giant hammer, fascinate us. Our son is less impressed when he is asked to model one of the moth-eaten animal pelt head dresses on display. Weapons and armour at the Roman Gladiator School, Italy. Tour over, we shuffle outside hoping for a dose of adrenaline. Ulfagar is chirpy as he hands out gladiator tunics to my husband and son, but not to me. Apparently there is graffiti written on a wall in Pompeii stating, ‘Celadus makes the girls swoon’: I’m happy to take my cue from ancient times and barrack from the side-lines. Ulfagar gives each of the would-be gladiators a wooden sword, and soon has them swooshing and prancing with four basic sword movements and some footwork: a downward whack to the head, a side slice to the neck, a backhander to the knees with a full body twist and a quick in-out thrust to the stomach. With the basics mastered, Ulfragar deems them ready for the real thing: huge metal swords (with blunt edges), a leather glove and a padded shield. A bonk on the head with one of these and our travel insurance could be getting a serious work-out. The clang of metal ringing triggers bloodlust and the pace of competition intensifies. Gladiators were deliberately paired to highlight mismatches, to make for more interesting competition: heavy with light, fast with slow. There is a nice mismatch to this pairing: big, old and clumsy versus slim, young and agile. The session culminates in a duel using duck-taped plastic swords where points are scored for body hits, giving father and son the opportunity to freely belt into each other, which they take to with relish. I can’t tell if they are doubled up with laughter, exhaustion or mortal blows to the stomach. Ulfragar eventually awards both combatants a certificate complete with new gladiator names. 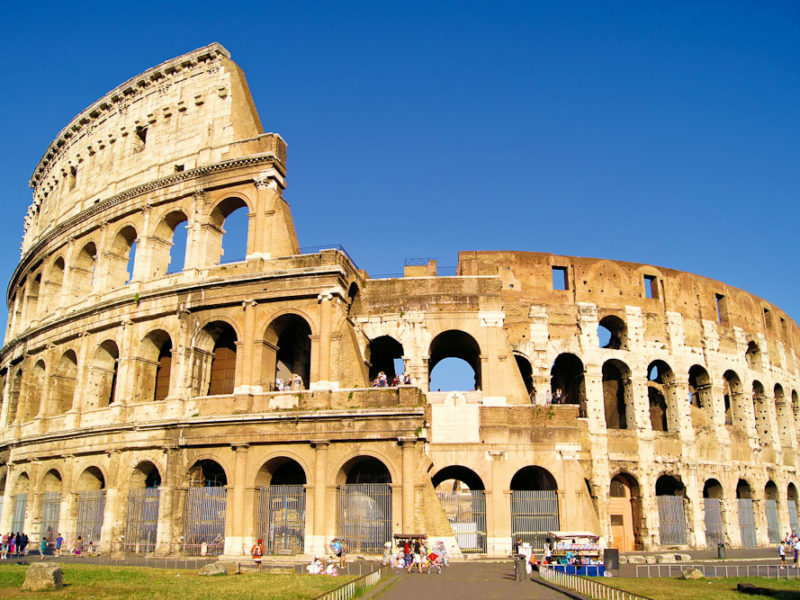 Spartacus and Maximus rattle back into Rome over the cobblestones and past the Colosseum with a new-found appreciation for the lot of a gladiator and the satisfaction of an afternoon of energy well spent. $79 per person for a two-hour session, which includes a guided tour of the museum and a sword lesson.